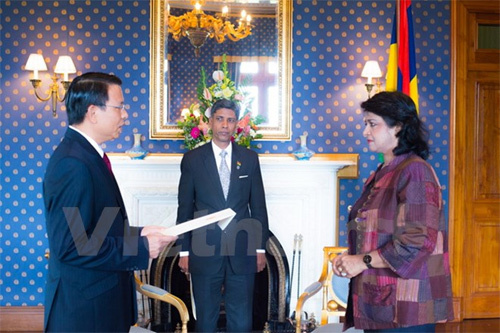 Last Tuesday, the Vietnamese Ambassador to Mozambique and Mauritius Nguyen Van Trung presented his credentials to Mauritanian President Ameenah Gurib Fakim. At the meeting he said the Vietnamese government and people treasured and wanted to strengthen cooperation with Mauritius in investment, finance, banking, fisheries, maritime services and tourism. He thanked Mauritius for closely cooperating with Vietnam within the framework of international organizations including the UN, UNESCO, and OIF. President Ameenah Gurib Fakim said Vietnam was a successful example in poverty reduction, sustainable growth and regional integration. 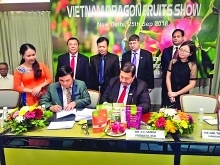 She said Mauritius was ready to serve as a gateway for Vietnamese goods and services to enter the African market and expressed her hopes for further cooperation between the two countries’ SMEs. She said Mauritius would always support Vietnam at multi-lateral forums/.